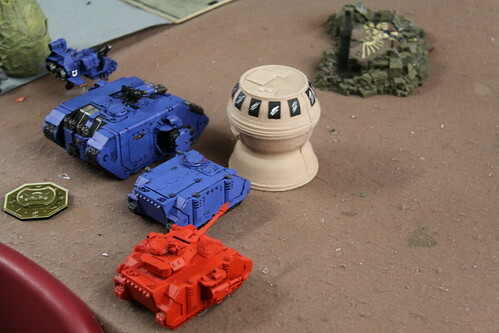 I was inspired by a thread over on Dakka about what the top tournament armies are in 40k. I think it's an interesting debate that is skewed by a lot of flawed data or assumptions. I think a major fallacy in the argument is citing anecdotes or personal experience about who is good with what army. Generalship is never relevant in these arguments. We're talking about codex prowess here. Assume in the discussion that all players are equal and then make the predictions. The other logic flaw is citing tournament statistics. Volume of wins doesn't mean a whole lot because some armies are a lot more popular than others, and just because they are necessarily good. Yeah, quality codices can be popular, but other factors are involved: Finances, aesthetics, fluff, availability. These all play a factor. 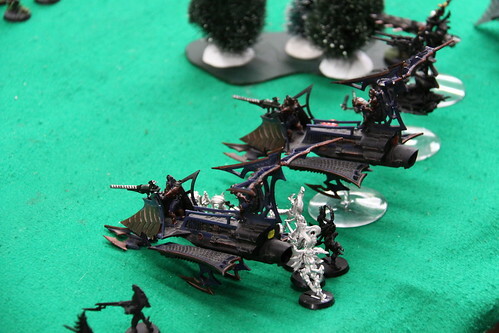 Chaos Daemons is an army with lousy model support that proves expensive and difficult to build. 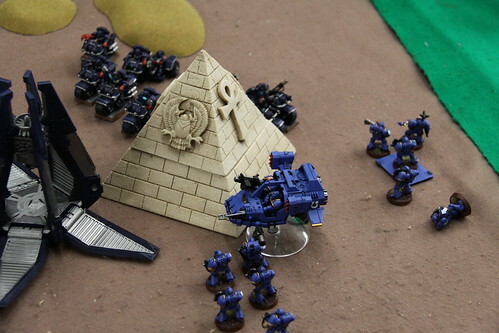 Space Marines have extremely popular fluff and wide plastic model availability. They show up at tournaments a lot more frequently. The other issue is that tournaments all play by a different set of rules. Some are comp heavy which basically gives weaker armies with a handicap. Some are soft score heavy which can often skew results. Even generalship awards sometimes don't mean much because of bizarre pairing methods or massacre scoring. I have repeatedly pointed out the flaws of those kinds of systems here. This illustrates data from our 4 tournaments this year. It shows the number of times an army entered a tournament and gives their results and then we create an average score. Does this tell us what the best armies are? Not at all. 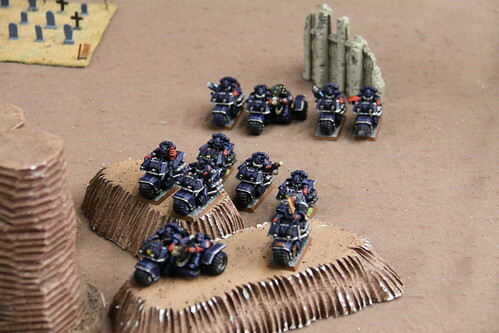 One major problem is these armies are piloted by different people. Generalship is not equally stated here, and I think that's an important point when looking at tournament results. On top of that the sample size is very small. 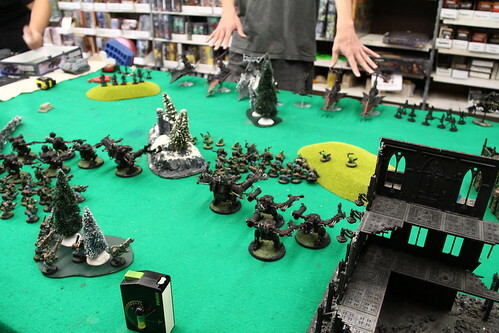 Only 4 tournaments and 15 rounds of 40k. Still the data is there to be viewed and we can learn a bit from it. 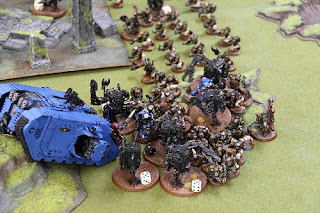 We see what armies are popular around here (Space Marines, IG, Orks, Daemons). We can see what isn't (Necrons and Inquisition). We can also see what is posting results at 1500 points in a soft score free tournament. Worth a look anyway. I'll start putting together additional data as more rolls in. The better the sample the more valid the results. Did an M11 sealed with some friends recently. Here was the pool I opened and the ensuing deck I built. Some decent "removal" here with Ice Cage. Mana Leak and Negate are solid. Sleep is a bomb. Jace's Ingenuity is very good. No real meat here though. Not many good creatures. Time Reversal is not good in limited. White offered some decent utility cards. War Priest of Thune and Solemn Offering are useful. I like Blinding Mage. I like Celestial Purge. The Knight's are a neat little combo. No bombs in this color though. Possible splash potential. Good removal. Mediocre creatures. No bombs at all. More splash potential. Or maybe I use black as my removal core. Lot's of playable stuff here. Lightning Bolt. Fireball. Chandra's Outrage. Fire Servant. Destructive Force. Wow. Nice creatures and an Overwhelming Stampede. Double Cultivate. Juggernaut is notable. Rootbound Crag useful if I go those colors. This deck has an absurd amount of removal. That might be a cause for a concern but I didn't see any of it in the games I played. I considered adding more creatures but just couldn't find anything worth using that didn't blow up the mana curve. The Berserkers of Blood Ridge were considered but I just decided that 12 creatures was enough base. In a number of games Fire Servant ended up comboing with burn spells which was funny. Chandra's Outrage for 8. Bolt for 6. A destructive force turned a sure loser into a win for me. Overwhelming Stampede was pretty underwhelming. Probably because I had so few creatures. My opponents had to play around it though so it had an impact even if it never translated into damage. If I could do it again maybe I dump fling for a berserker. My low creature count didn't seem to matter. I went 6-0 in my games. Cultivate really allowed me to maximize splash from other colors. Doom Blade and Gravedigger became options that I used. I considered Assassinate but decided I had enough removal so I left it out. I even was able to play transformer with the sideboard. In some games I boarded in a plains with the enchantment removal for my opponent's double pacifisms. All in all a good sealed pool with good results in my games. 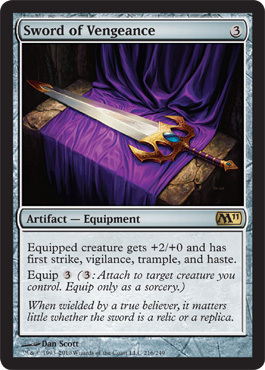 I hope to do another M11 sealed soon. Sprue Posse #4 was a monumental success with a sold out ticket of 12 competitors looking for generous prize support. Congratulations to Jon Regul for winning the tournament with a perfect 4-0 record. His list proved to be scissors in a field of paper and he cut all of his opponents to shreds. You can find the full standings here. 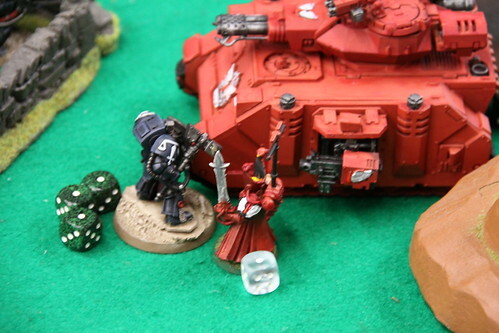 Congratulations to Jon Regul for bringing home the Sprue Posse Open #4 title. Jon weaved his Kan Wall list through a field of 12 other players to come out on top with a spotless 4-0 record and some generous prize support. You can check out the coverage here. Here were the final standings from the tournament. 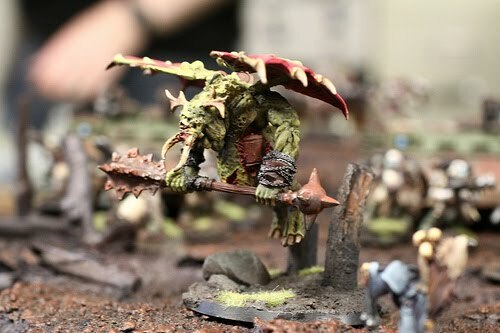 Jon is now 4th place in the running for Sprue Posse player of the year. I'll post full lists and pictures later. Sprue Posse Open #4 is underway. 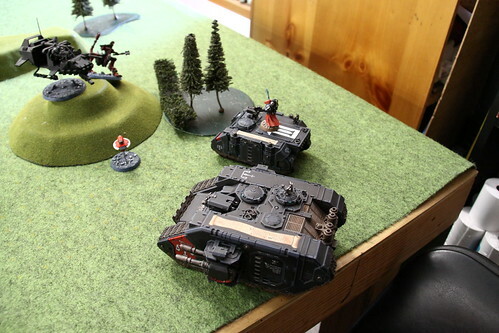 Mission is capture control with a dawn of war deployment. I'll update round results as they come in. Rogues are a nefarious newer tribe for the Tribal Wars game. Although introduced very early, they became quite viable with the release of Llorwyn block, and Morningtide increased their power level significantly. Rogues can take advantage of their unique prowl keyword ability to get into play very quickly. They strike fast with cheap early drops, many of whom have some form of evasion. 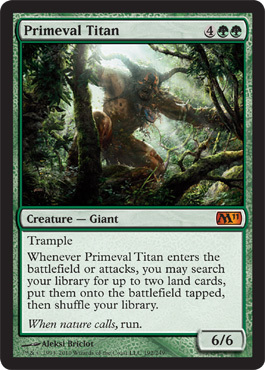 We can precipitate that by tempo effects that can stall out slower lumbering opponents. Control cards like Paralyze are cheap effective ways of dealing with larger blockers and force the opponent to make choices about either making their blockers viable or slowing down their deployment. Pestermite combos nicely with this effect. On top of that Rogues can use typical removal like the under-costed agony warp for quality combat tricks and recoil to remove anything truly problematic. Discard is compounded with cards like Thoughtseize or the effects of Oona's Blackguard or Prowler. Because of a very low curve that functionally tops out at 3 mana, we can afford to go very lean on land. Only 22 in this deck, which gives us room for more removal. In fantastic lore rogues are fast, strike without warning and do damage very quickly. This deck is no different. 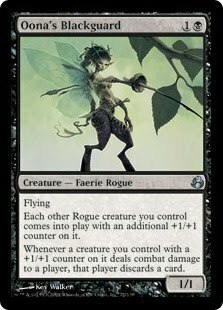 Goblins has been a popular tribal deck in any format since the early days of sligh. The tribe was considered underpowered however until Onslaught block was released and the Scourge set specifically catapulting a once marginal tribe into one of the most powerful. I basically lifted the below list straight from an extended season way back in 2003. 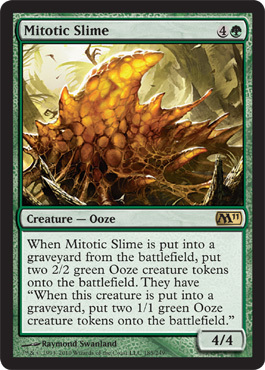 The original deck was coined Gob-vantage. It combined the deck stacking ability of Goblin Recruiter with the card drawing power of Goblin Ringleader that led to explosive combos of hasted Goblin Piledrivers attacking for well over 20 damage all in one turn. 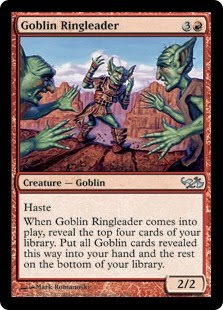 "Turn two Goblin Recruiter puts the following cards on top of your library: Goblin Warchief, Goblin Ringleader, Skirk Prospector and three Piledrivers. You draw and play the Warchief and on the next turn you play your Ringleader and put the Skirk Prospector and three Piledrivers in your hand. With the remaining mana you cast a Prospector and sacrifice your Ringleader, Recruiter and Prospector to cast all three Piledrivers and attack for the win." Gob-vantage was a solid deck back then in Extended and in Classic Tribal Wars almost nothing changes. The vast majority of goblins hasn't really improved since then with apologies to beaters Warren Instigator and Goblin Chieftain. The cards in this version are basically the same with some sideboard concessions main-decked since card swapping isn't allowed in Tribal. 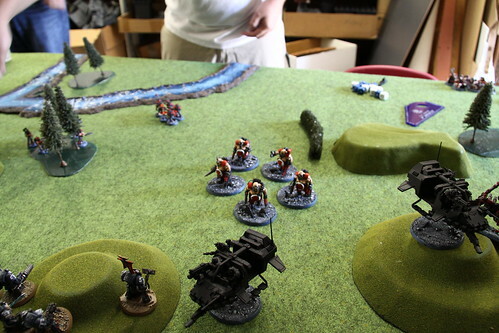 I moved the Assassin and Sharpshooter into the main deck and added some sac lands, landkill and a Pendelhaven. 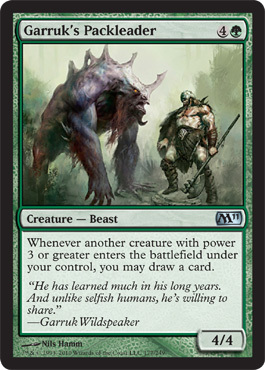 Gob-vantage is arguably the most potent tribal deck in the format right now. It has all the tools to win, and it can also do it very quickly with the ability to reduce an opponent with a significant life and board advantage to zero in a single turn. Review of unprinted artifact and land cards below. The full spoiler is still located here. I also reviewed white, blue, black, red and green in previous articles. Kills just about any creature dead and works for any color. A top limited pick and I suspect it will show up in a lot of constructed decks as well, probably confined to the sideboard though. I like this card in limited since it can make a decent deck better. Probably more of a casual card in constructed. Has potential as sideboard tech for some decks in constructed. Nothing special in limited although it's a nice foil to millstone decks if that becomes a concern. Cool fluff here but not much else. Playable in limited. Some cool potential here in limited if you can survive long enough for it to trigger. Too slow for serious constructed. Potential here for a mono-brown artifact deck at the constructed level. 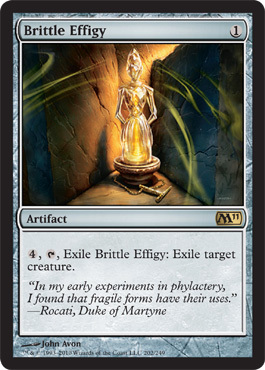 I wouldn't bother with this in limited unless you can supplement with a number of other artifact creatures. 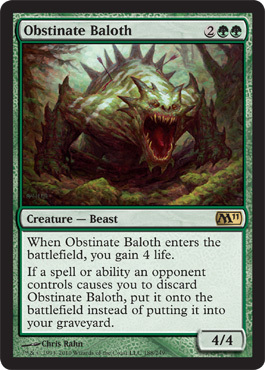 A solid creature for a good cost playable in any color. It should find it's way into any limited deck. 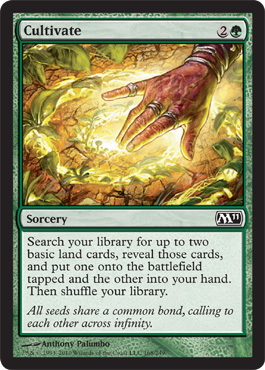 Outstanding pick for limited, especially if your creatures are on the smaller side. Probably too slow for serious constructed play. A revised howling mine has potential since it's easier to slow down when you no longer need (or want it helping your opponent). Might find it's way into a control deck. More likely a casual card. Expensive but can transform creatures into more potent killing machines. A nice limited pick. I don't hate this card but it sure is pricey. It's a nice stalling technique but 5 mana seems pretty heavy for a temporary effect. A decent mid range draft pick. Certainly worth running in any sealed deck. So that wraps all the new cards in the set. I think Green and Red probably got the most help here, especially in limited play. 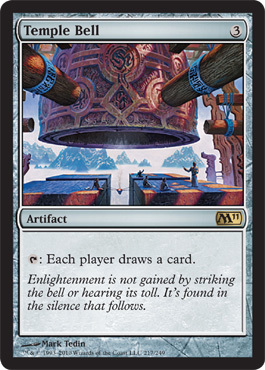 Also notable in M11 was the large number of Vintage playable cards. If you are playing in the pre-release this weekend let me know how it goes for you. Maybe I'll do a breakdown of your deck and sealed pools if you send them in.